This genus is accepted, and its native range is India to Myanmar, Sri Lanka. Annual, or perennial (1). Culms geniculately ascending (1), or decumbent; 15-26.25-40 cm long; rooting from lower nodes (1/1). Ligule an eciliate membrane (1), or a fringe of hairs (1). Leaf-blades linear, or lanceolate (1). Inflorescence composed of racemes. Racemes single (1), or paired, or digitate (1); unilateral. Rhachis fragile at the nodes; broadly winged; foliaceous. Spikelets in threes (1), or subtended by an involucre (1). Fertile spikelets sessile; 2 in the cluster (1), or 3 in the cluster, or 4-6 in the cluster (1). Companion sterile spikelets sessile (1/1); 2-6 in the cluster (1/1). Involucre composed of imperfect spikelets (1/1). Pedicels oblong (1/1). Companion sterile spikelets absent (1), or well-developed (1); deciduous with the fertile (1/1). Spikelets comprising 1 basal sterile florets; 1 fertile florets; without rhachilla extension. Spikelets ovate; dorsally compressed; 3-4.3-6 mm long; falling entire; deciduous with accessory branch structures. Companion sterile spikelets absent (1), or well-developed (1); deciduous with the fertile (1/1). Spikelets comprising 1 basal sterile florets; 1 fertile florets; without rhachilla extension. Spikelets ovate; dorsally compressed; 3-4.3-6 mm long; falling entire; deciduous with accessory branch structures. 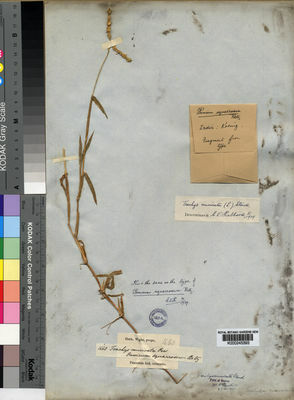 Glumes shorter than spikelet; thinner than fertile lemma. Lower glume subulate (1), or ovate (1); coriaceous (1/1); 0 -veined (1/1). Lower glume lateral veins absent (1), or distinct (1). Upper glume lanceolate; 0.5-0.65-0.8 length of adjacent fertile lemma; membranous (1), or chartaceous (1); 3 -veined. Upper glume apex acute, or acuminate (1). Basal sterile florets barren; with palea (1), or without significant palea (1). Lemma of lower sterile floret lanceolate (1), or ovate; coriaceous; 9-10 -veined (1), or 11-13 -veined; acute (1), or cuspidate (1). Palea of lower sterile floret membranous (1/1). Fertile lemma ovate; chartaceous (1), or cartilaginous (1); of similar consistency on margins (1), or much thinner on margins (1); without keel; 3 -veined (1), or 5 -veined (1). Lemma apex acute. Palea cartilaginous. Lodicules 2 (1/1); membranous (1/1). Anthers 3 (1/1). Caryopsis with adherent pericarp (1/1); oblong (1/1). Embryo 0.5 length of caryopsis. Hilum punctiform (1/1). Trachys muricata (L.) Pers. ex Trin.